Today, April 22, is Earth Day and the theme this year is "Protect Our Species." The goal of the campaign is to raise awareness of the accelerating rate of loss in plant and wildlife populations due to habitat destruction, pollution, climate change, pesticides and other human-related activities. in maintaining a healthy ecosystem in construction areas. The transportation sector is responsible for more than 42 percent of the state's carbon emissions - a concern for all of us as we see, experience and plan for the effects of climate change. Here in Washington state, we are often reminded of the need to protect our resident orca whales, salmon, pollinators and other wildlife as well as the habitats they depend on for their continued existence. Building wildlife connections helps keep animals and people safe by limiting the possibility for vehicle/wildlife collisions. We use native plants to restore areas disturbed during construction to establish healthy plant communities that out-compete undesirable plants and provide pollinator habitat. Just east of Snoqualmie Pass, we teamed up with the U.S. Forest Service to collect native seeds and cuttings to grow at local nurseries. Once the plants matured, we planted them along the Snoqualmie Pass East project to restore the habitat we affected during the first phases of the project. In fall 2018, we began testing a variety of seed mixes and soil preparation methods at the Scatter Creek Rest Area along I-5 north of Centralia. We're monitoring the site for successful establishment of flowering plants and increased pollinator activity. The results will help us develop restoration and maintenance practices that provide future habitat for pollinators along roadsides. 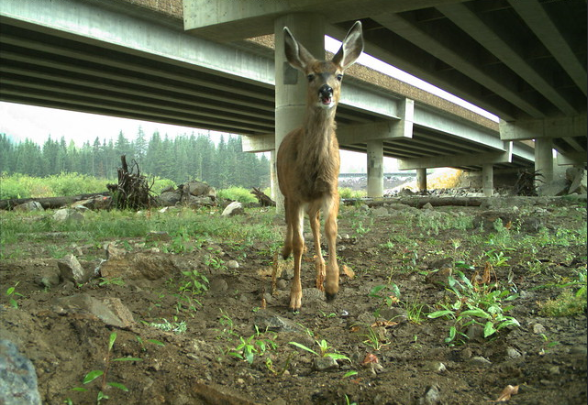 We're working with Washington State University on a study of SR 20 North Cascades Highway Wildlife to gather information about the patterns of deer crossings along SR 20 between Twisp and Early Winters Campground. The goal of the study is to gain understanding of the environmental factors that affect deer-vehicle collisions and to provide recommendations that could reduce the number of collision each year. fish migration and the environment in those areas. Since 2018, we've been exploring strategies to quiet our ferries to help protect orca whales, including ambient sound levels from ferries by slowing down in Haro Strait when whales are present. To improve air quality and reduce emissions, our ferries use B5 biodiesel - a blend of 5 percent biodiesel and 95 percent ultra-low sulfur diesel. This year we will increase use of B10 biodiesel. We are also working with the Governor and Legislature to move forward with converting vessels to hybrid-electric propulsion, which would reduce carbon emissions from our current fleet by 25 percent. 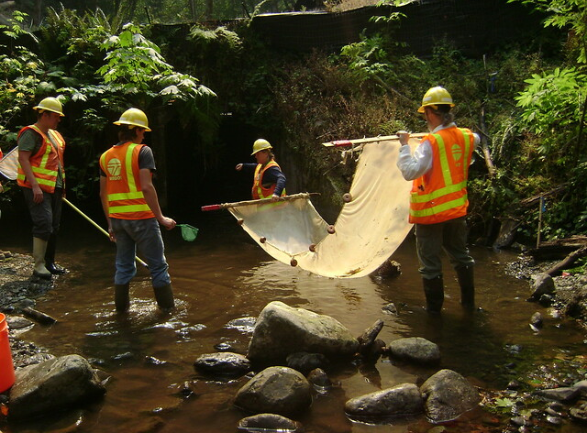 We've already corrected more than 300 barriers to fish passage, improving access to 1,000 miles of stream habitat. We're continuing our work to correct an additional 415 barriers, restoring access to 90 percent of blocked habitat in the northwest part of the state by 2030.
provide safe options for everyone, regardless of mode of transportation. Promoting active transportation such as walking and bicycling by investing in connected infrastructure to give people more - and safer - options for getting around. 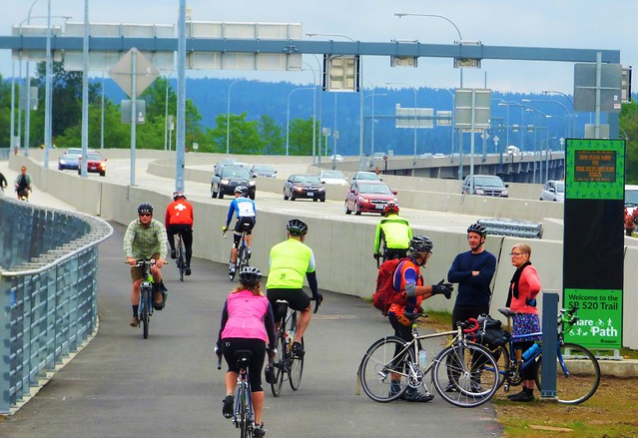 For example, the SR 520 trail across the new SR 520 bridge saw more than 328,000 trips in its first year, giving bicycle riders, runners and walkers a safe alternative for crossing Lake Washington. We continue to work to replace petroleum-fueled agency vehicles with hybrid and electric vehicles. As of late 2018, we had 45 plug-in hybrid electric vehicles, 20 all-electric vehicles and 100 hybrids. 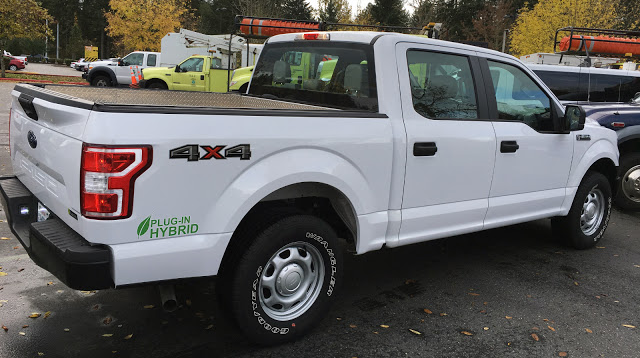 Last year we also became the first state agency in Washington to begin using a hybrid work truck. We're removing and replacing highway lighting with more energy-efficient LED lights. A project in 2017 converted 1,974 high pressure sodium lights with LED technology, resulting in energy savings of more than 68 percent. helping to cut down on our carbon footprint. This is just the tip of the iceberg of the many ways we support a sustainable and environmentally friendly transportation system. We're proud of the work we do as an agency and will continue to look for ways we can make a difference, on Earth Day and every day. Spring is here bringing longer days, warmer weather and increased progress on improvements along the I-5 corridor near Lakewood and Joint Base Lewis-McChord as part of the I-5 - Steilacoom-DuPont Road to Thorne Lane Corridor Improvements project. 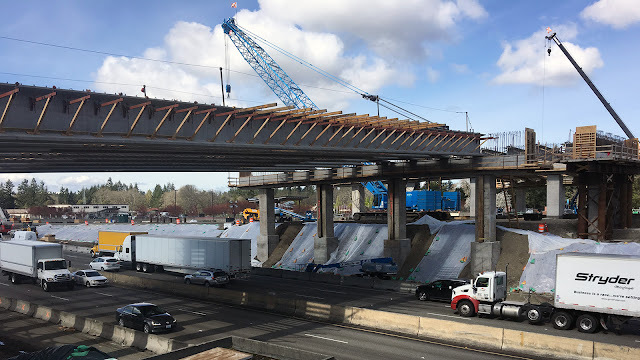 Construction on the Berkeley Street overpass, also known as the Freedom Bridge, began in October 2018, and the tell-tale signs of the new structure are noticeable to travelers on I-5. 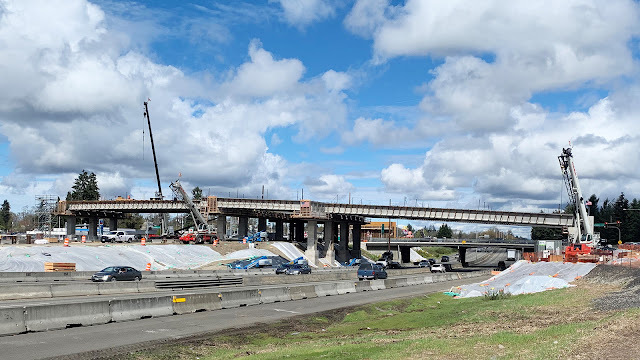 Crews installed off-ramp and bridge piers, poured bridge abutment structures, and just recently installed the bridge’s 35 girders to support the new overpass deck. The new overpass spans all lanes of I-5 and the adjacent rail line, elevating traffic over the trains. The size of the new overpass is eye opening compared to the existing structure that was built in 1954. This new overpass had to meet height requirements over the railroad. Crews will also raise the elevation of I-5 at Berkeley Street; once in place, it won’t make the new bridge feel so tall. Once the new overpass is opened to traffic, it will have two lanes in each direction with a large shared use path and bike lanes. The new Berkeley Street interchange is scheduled to open this winter. While construction on the Berkeley Street overpass carries on, Thorne Lane construction has kicked into high gear. Crews are clearing the project site to where bridge support structures will be built. They’ve also begun constructing noise walls adjacent to northbound I-5 from 41st Division Drive to Berkeley Street, and along southbound I-5 adjacent to the Thorne Lane interchange. Crews are also widening I-5 to add one lane in each direction and additional auxiliary lanes to add capacity and improve traffic flow. The new overpasses being built at Berkeley Street and Thorne Lane are much wider and taller than the existing overpasses. Contractor Guy F. Atkinson are working hard to minimize traffic affects and road closures for this project. Most work happens at night and the new overpasses are built next to the existing overpasses. Expect to see continued overnight ramp and lane closures and be alert for signed detours. The new Thorne Lane interchange is expected to open in summer 2020 and the final traffic configuration for this project is scheduled to be in place in fall 2020. When someone asks you to get involved in a planning process — especially a long-range statewide process — you might wonder why you should bother, since actual change is a long way down the road. Why should you care enough to take a 10-minute survey on the state Active Transportation Plan update by June 30, 2019? Because decisions about how and where people should be able to walk, use their wheelchair, or ride a bicycle comfortably and safely start with you telling us that matters to you. Because our state plan shapes how we work with our partners in the towns and regions where you live and move around every day, and will help us agree on shared priorities. This survey is for anyone who uses transportation — that means you. We ask about your transportation habits and what you value in a system that can work well for everyone – no matter where they live, how much money they make, or how age or disability might affect how they use transportation. As a multimodal agency, it’s important for us to create safe transportation facilities for all users. ATP E-news: This occasional email will tell you what’s happening next in the planning process and invite you to take future surveys. We encourage you to subscribe here. WSDOT Walk and Roll Active Transportation e-news: Information 2-3 times a month on a wide range of topics related to active transportation in Washington state, including grants, training opportunities, and technical information in addition to news on the Active Transportation Plan. Be sure to subscribe for Walk and Roll here. On social media: Use the #WSDOTactive tag to find news you can share. We’re looking to improve our transportation system to provide safe travels for all modes of transportation. On the web: Information and all language versions of the survey, including Spanish, Russian and others, will be linked on our Active Transportation Plan website. 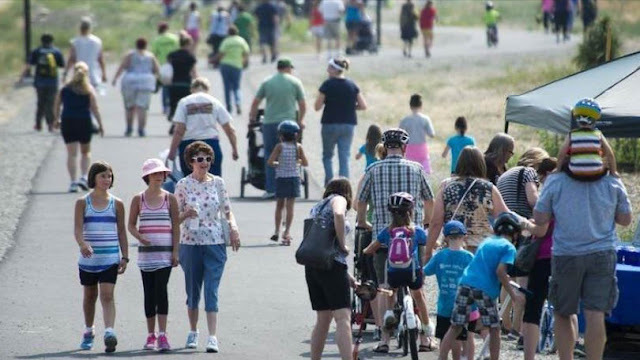 You will also find subscription links for ATP E-News and WSDOT Walk and Roll on the website. Request materials or presentations: Let us know if you need some flyers to post or hand out, want to request a speaker if one can be made available, or will volunteer as a community ambassador to spread the word. What IS active transportation, anyway? If you’re still wondering what we mean by active transportation, it’s using an active means of travel such as walking, biking or skateboarding to get from one place to another. Almost everyone uses active transportation at some point in a trip, whether walking to a bus stop, bicycling to work or rolling home from a ferry terminal. The survey will go through June 30, 2019. The plan is scheduled for completion in December 2019. You’ll have a chance to review and comment on the draft plan; sign up for our e-news to receive announcements. Imagine you're one of our maintenance crews. It's 20 degrees outside and you're driving a snow plow during this past February's snow storm. And then, boom, a flat tire! Snow is building up, conditions are getting worse and you need to get moving. Who do you call? Our fantastic group of mechanics, of course. 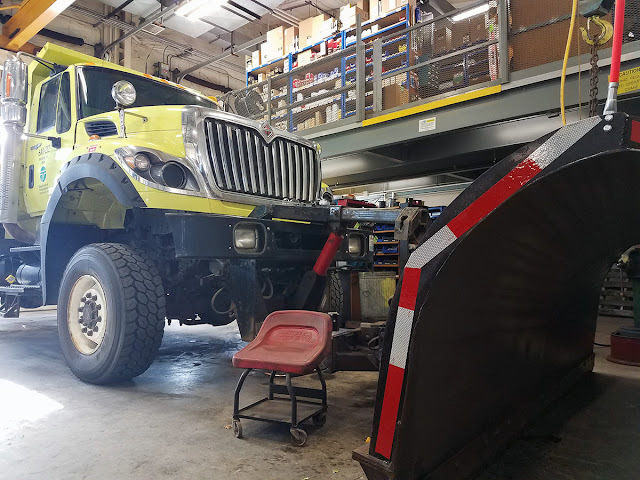 Referred to internally as "TEF" (Transportation Equipment Fund), our mechanics are one of our true unsung heroes, especially during our most recent winter storms. Our mechanics keep the equipment our Incident Response Team (IRT) and maintenance crews use in good working order. The group also maintains equipment used by our ferries, our traffic signals and highway lighting. Using 35 repair shops and 130 fuel stations statewide, staff is available 24/7 to keep our equipment up, running and ready to respond to whatever weather comes our way. Yes, this even means the occasional call-out in the middle of a storm. This happened several times during February's storms. Our mechanics maintain approximately 14,000 equipment items. This includes, among other things, 4,800 vehicles ranging from tractors to dump trucks, 1,300 equipment attachments like sanders and plows, and 4,500 radios. Much of the equipment was utilized this winter. The relationship between our maintenance groups and mechanics is similar to that of a lessee and lessor. Our maintenance offices rent the equipment and vehicles you see out on the roads from TEF, and in turn, our mechanics do most of the repair work and caretaking. This is a standard procedure that allows TEF, a non-appropriated program, to pay for equipment replacement, fuel, employee wages and more. This truck is in the midst of engine repairs. By early November, the mechanics in each shop have already done much of the work that goes into preparing for the winter. They've outfitted trucks with plows and attached hopper-sanders and tailgate sanders. End-of-summer inspections require mechanics to go through checklist after checklist evaluating every inch of a dump truck and sander. They encounter familiar issues each year. If it isn't properly cleaned after a winter operation, a truck with salt left in it can see corrosion. Other equipment, like sanders and plows, accumulate rust. The hydraulics associated with the sanders are also evaluated so maintenance crews don't have to deal with unresponsive equipment in the field. Rust and corrosion are more visible on vehicles that see a lot of action in the winter months. There is also the challenge of new equipment. 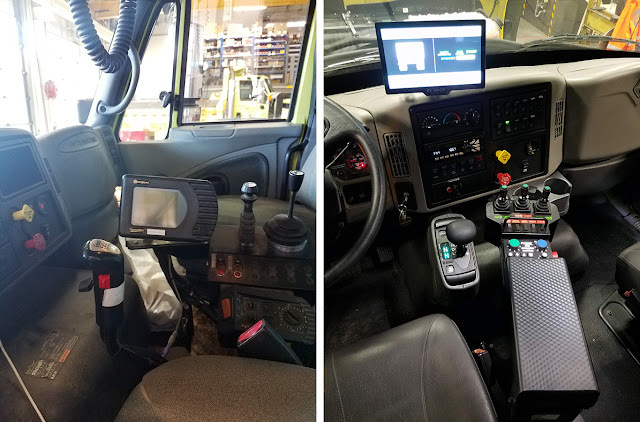 Newer trucks often come with a new computing system, including an AVL (Automatic Vehicle Locator) that monitors how much sand, salt or liquid was dropped and where. Even the most seasoned operators can have a difficult time figuring out how to use a new system. Part of the equipment technician's job is to test the system and pass along tips to the maintenance side on how to use it. It's been a very busy winter for our crews, including our mechanics team. 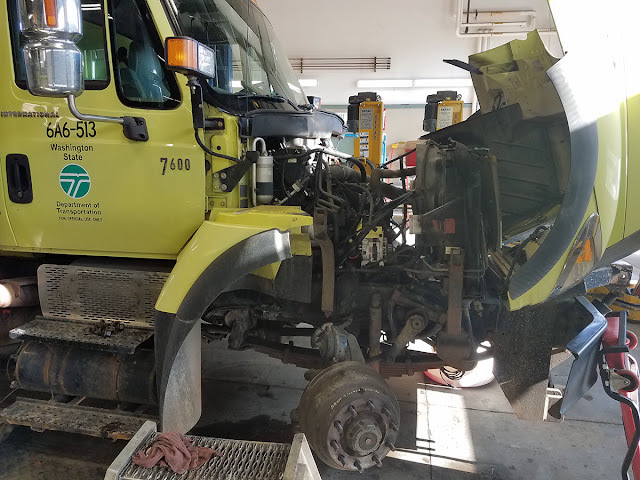 So the next time you see a snow plow on Stevens Pass, or a mower in a highway median this summer, take a second to appreciate the behind-the-scenes effort it takes to make sure all of our equipment stays moving. They told me it would be gross. They said it belonged on that show "Dirty Jobs." I'd be covered in dirt, and feel it my teeth, they warned. A look up at a Ship Canal Bridge expansion joint. Vehicles pass over at highway speeds. Twice a year, we delay the opening of the I-5 express lanes through Seattle for a particular type of weekend maintenance. Crews use the morning closures to clean the drains on the Ship Canal Bridge. 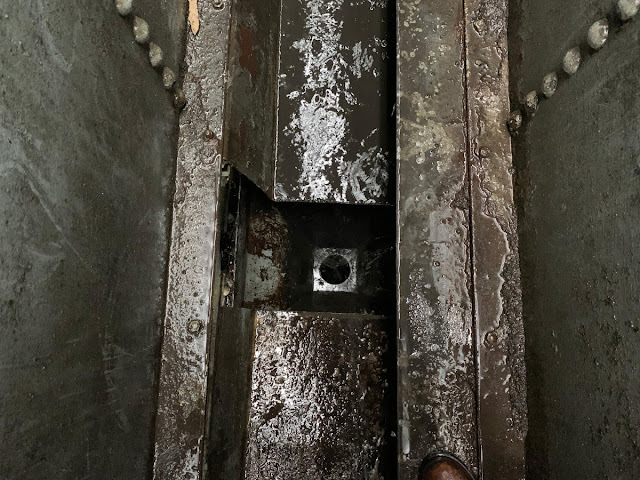 These drains, known as scuppers, collect whatever comes off the I-5 mainline and through the expansion joints. 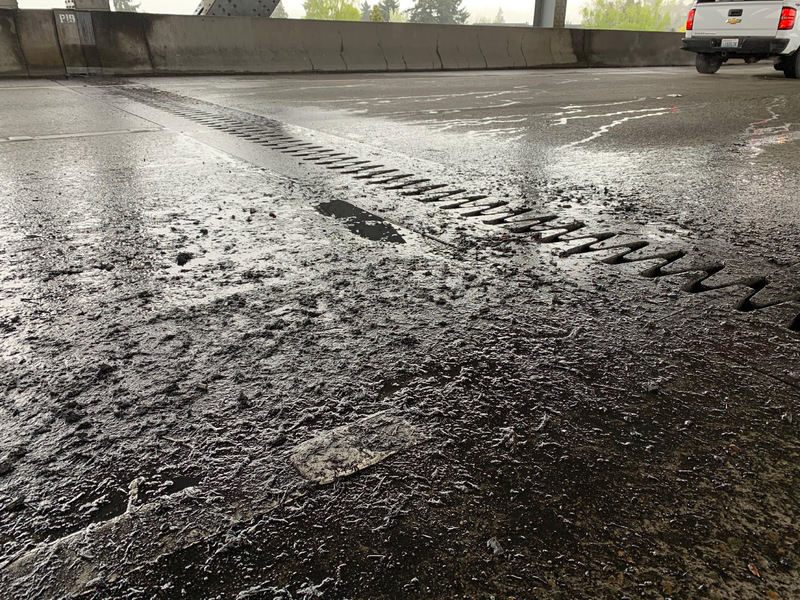 If we don't clean the drains regularly, water can spill out the sides or find its way to the express lanes, creating a safety hazard for drivers. So why close the express lanes and not the upper bridge deck itself? Crews approach the scuppers from below, in the express lanes. 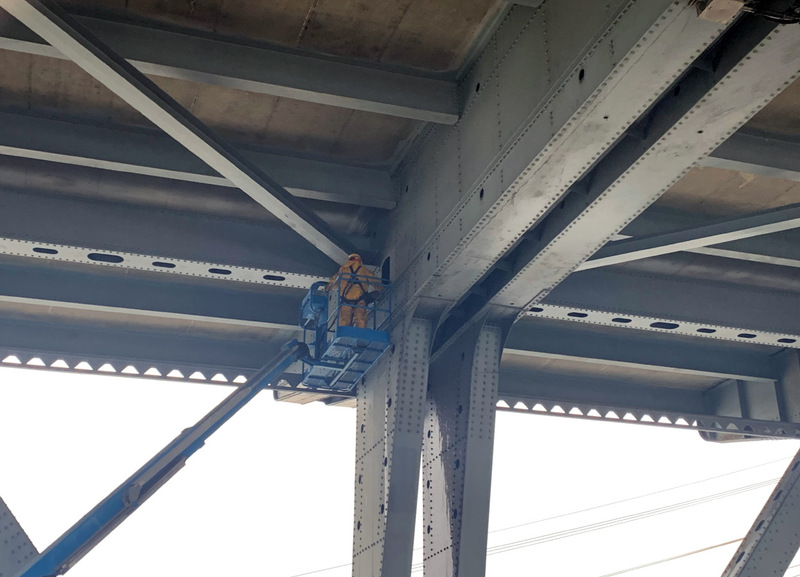 A lift takes a team of three — two to clean and one to operate the lift and carry a high-powered hose — to each of five box beam girders that span east to west below the bridge's surface. After being harnessed and lifted 30-40 feet into the air, crewmembers crawl through a hole in each girder with shovels and hose in hand. Maintenance crews are lifted up to a narrow hole in the girder where they crawl through. 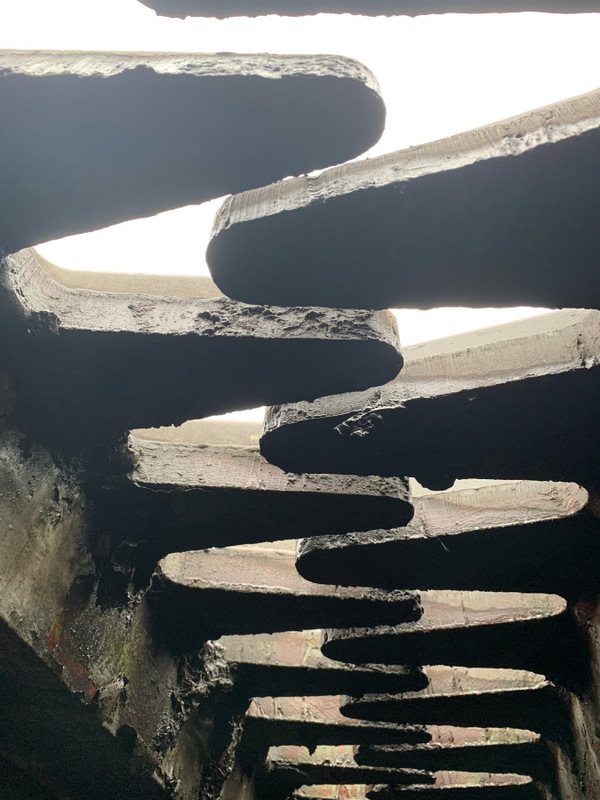 Their mission is to clear the two drains located in each girder and confirm the downspout (about the diameter of a golf hole) is draining smoothly. It's surprisingly roomy inside the girders. I'm 6-foot-5 and I was able to stand upright, as was our 6-foot-4-inch supervisor. There's almost enough space to stand shoulder-to-shoulder, but not quite. Two other scuppers are about half the size of this one. And yes, it was gross. A trough with water at shin-level ran the length of the girder. Piles of sludge had formed. Cigarette butts and a few pieces of plastic floated around us. The noise of semis, buses, motorcycles and passenger vehicles just inches above our heads made it tough to communicate. It was eerie to see the shadows of highway-speed vehicles appear, then disappear in an instant. A hose and shovels are used to collect and remove sediment. 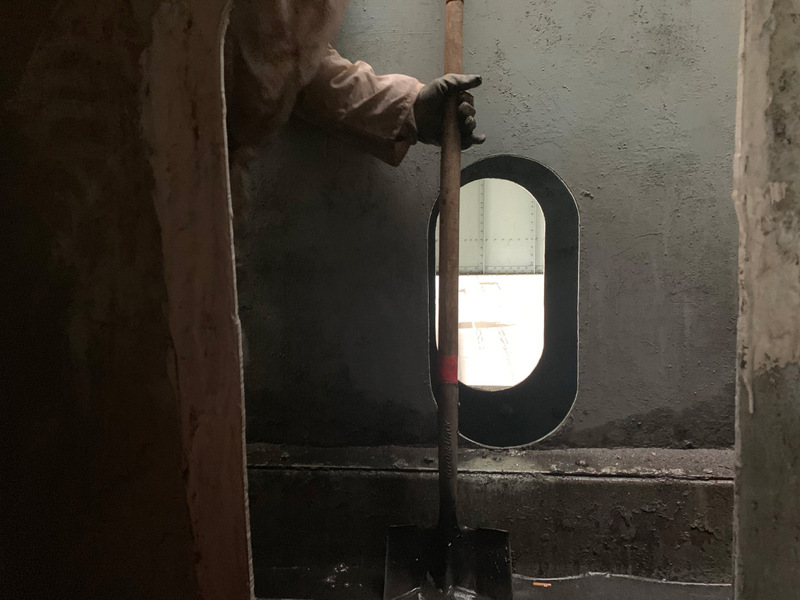 After clearing the drains, one crewmember uses a shovel to collect the sediment and push it toward the drain, while the other maneuvers the hose to break it up so it flows down the drain. Loose sediment often escapes the trough and falls to the express lanes during this process. This is the most important reason to keep the lanes closed. The debris could crack a windshield, startle a driver or affect visibility. 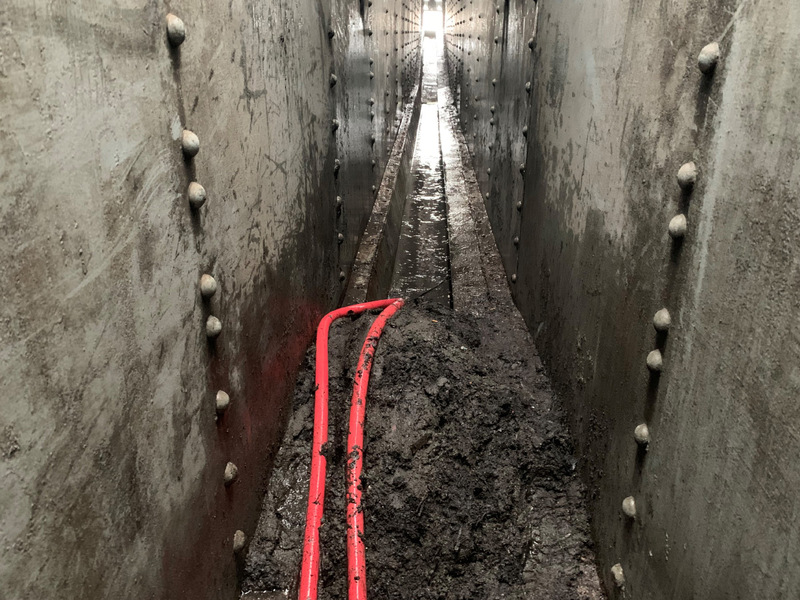 At ground level, a vacuum truck collects whatever the crew pushes into the drains. A cleared drain and the downspout that leads to ground level. The downspout is about the diameter of a golf hole. Crews close the express lanes because debris often spills out during the cleaning. Crews are pressed for time during each of the cleanings. It's safer to work when it's light out, so they generally start later than other maintenance operations. The crew takes a number of safety precautions when they head into the girders, including wearing personal protective equipment and harnessing themselves to the lift as they head up and into the girder. Unfortunately, there's also the added risk of a wrong-way driver who enters the express lanes. A fourth member of the crew stays in the water truck below to supervise. While cleaning a drain may sound simple, I saw first-hand it's not easy, or pleasant. But it was impressive to watch our workers tackle it. It's not just a dirty job, worthy of a visit from Mike Rowe; it's an important one.